Soltobay Zaripbekov was born in Kyrgyzstan 1974. 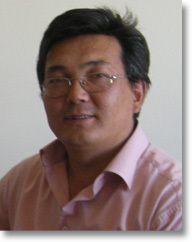 He has published poems in the Kyrgyz magazine Булак [The Stream] and in the Turkish magazine Yüce Erek [The Great Aim]. He is currently working on his first book. He graduated in Philosophy from Gazi University, Ankara, Turkey in 2000, and in 2004 obtained his postgraduate degree in Philosophy from the Social Science Institute at the University of Ankara. He has worked in various managerıal posts in Turkey, including ındustry and electronics and in 2008, he was appointed a Vice Dean at Manas University, Bishkek, Kyrgyzstan.